Nicely furnished-Ground level condo - walk out to lake level from screened-in deck. Freshly remodeled, tasteful stylish décor throughout!, Nice modern finishes to bath, Custom built-in closets and shelving in bedroom, Open Kitchen/Living Room combo, 2 flat screen TVs and DVD players. WIFI included. Condo complex located near the 21 mile marker with a swimming pool and ample off street parking. 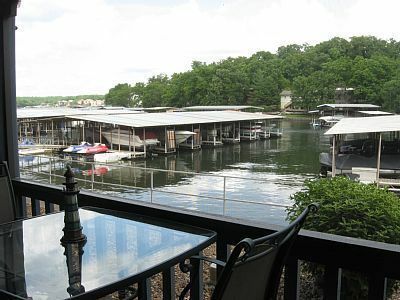 Boat slips available for rent with a PWC and Houseboat rental facility next to complex. Easy access to Highway 54! Been coming to the lake since 1996, decided to purchase a 2 bedroom unit in the same complex and decided to keep this unit to use when we have guests stay with us. Great location and you walk right out to the lake. Very nicely updated and very clean with easy access to the lake. We had a great time on our weekend getaway. Very nicely updated condo that is exactly as it is shown in the pictures. Spotless!! It is close to a lot of attractions and conveniently located in the back of the cove, so no worries about the big cruiser waves disrupting your lake plans! Grocery store, outlet mall, marinas and plenty of restaurants as well as golf courses are nearby. We will be back to this location, hopefully sooner than later. Lisa, thanks you for the nice review. We are delighted that you enjoyed our condo, hope to hear from you again. We enjoyed our stay. Condo was clean and had everything we needed. Location was great with easy access to Lake attractions. Very relaxing stay. Had a great time on a last minute midweek get away. Wish the weather would have been better, but the condo was great. Clean and comfortable condo that had everything we needed! Beautiful, clean, comfortable place to stay located on the lake. Home is nicely decorated and supplied for your stay. Owners are very accommodating. There is a screened in porch that is perfect for grilling and enjoying a good meal with no pesky insects. Also a nice pool to swim in. Grocery store close by and plenty of shopping all around. It is very peaceful and quiet and everyone is pleasant and friendly. Highly recommend this property! Very clean and well equipped condo with attractive beach decor. We really liked the screened in porch, nice with no bugs for eating and enjoying the view. Glenn, Thank you for the nice review. Yes, the screened in porch is perfect for sitting outside and enjoying the lake. Hope you rent with us again.